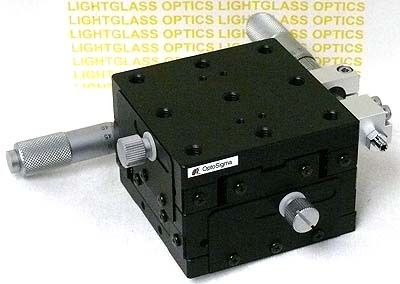 The OptoSigma 123-0745 65mm Aluminum Ball Bearing Stage XY Side Drive has a 65mm square top plate, drilled and tapped with M6 holes on 50mm centers, so it is the Metric version of this stage. It has 25mm of travel, controlled with the included OptoSigma Micrometer Actuators. This stage utilizes precision ball bearings for its smooth movement and yet is an economical X-Y two axis stage. Overall height is 46mm tall.